If you read any food blogs other than this one, chances are you have had your fill of posts about peanut butter pie. 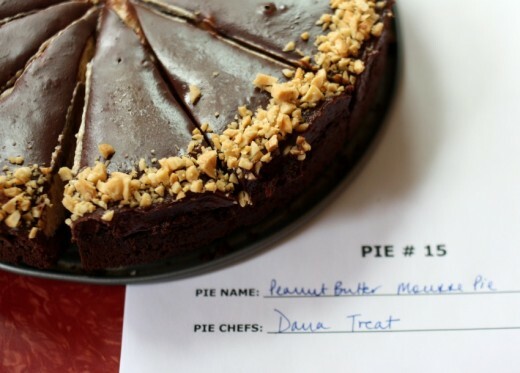 If you have no idea what I am talking about, food bloggers around the world have spent the past few days making peanut butter pie, and writing about it, because one in our midst lost her husband unexpectedly. When someone experiences tragedy, our natural reaction is to want to help – even if we don’t know the person who is suffering. I always offer food to people in need but seeing as Jennie lives clear across the country, cooking dinner for her and her daughters was not realistic. 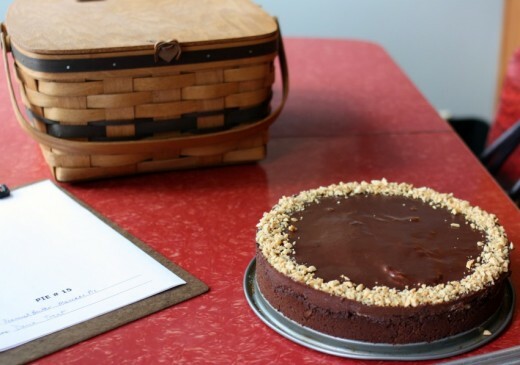 Jennie took to her blog and wrote a heartbreaking post about her husband’s love for peanut butter pie and that, if we wanted to help her, we should all make one in his honor. She said that she never made it often enough for him, that there was always tomorrow or the next week and other dishes, or even just plain old life, got in the way. I think this emotion resonated with so many people and it is the reason that there is peanut butter pie everywhere you look. We all assume that if our families are intact today, the same will be true tomorrow. We all know life is fragile, relationships are tenuous, and yet we soldier on as if everything will last forever. Of course we do. If we didn’t, we would be living in a state of constant fear and that isn’t good for anyone. Randy travels frequently for work, I send my kids off to school/preschool/camp, where they are in the hands of airline captains, teachers, and counselors. If I wondered every single day whether that plane ride or bus ride or car ride was going to be their last, I would not be able to get out of bed in the morning. But hearing of the death of a beloved spouse and father of two young children certainly gives me pause and makes me reflect on what I have and how fortunate we are. Anyway, more eloquent writers than me have done a much better job of writing about Jennie, about loss, about this amazing community of food bloggers who rally around our own. I’m a little late to the party but I did make a peanut butter pie. I didn’t make Mikey’s version, I made one that has been in my “to make” file forever and I brought it to a pie party. 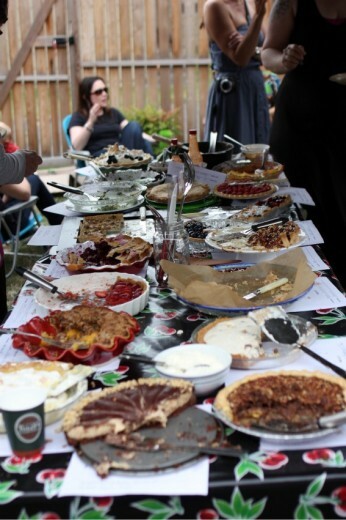 Every year, our friends Matt and Jessica throw a pie party where there are categories, judging, and prizes. I am not a competitive type but I do have a reputation to uphold and truthfully, I had plans to bring a different kind of pie. One that celebrates summer in Seattle with nectarines and blackberries or apricots and raspberries. But I couldn’t make a pie and not make a peanut butter pie. I didn’t win and I didn’t care – the pie was delicious. Bittersweet though. Preheat the oven to 375ºF. In a medium glass bowl, combine the chocolate and butter and microwave at high power in 20-second intervals until the chocolate is melted. Stir well, then stir int eh cookie crumbs. Press the cookie crumbs over the bottom of a 9-inch springform pan and 1½ inches up the side. 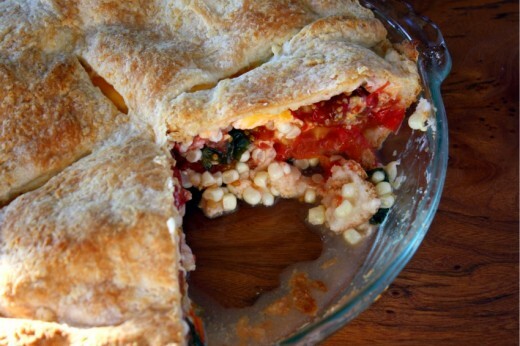 Bake the crust for 10 minutes, or until set; the crust will continue to firm up as it cools. In a large bowl, using a handheld mixer, beat the cream cheese with the peanut butter, sugar, and vanilla extract until blended. In another large bowl, using the same beaters, whip the chilled cream until firm. Fold one-third of the whipped cream into the peanut butter mixture to loosen it, then fold in the remaining whipped cream and ½ cup of the chopped peanuts. Spoon the filling into the crust, smoothing the surface. Sprinkle lightly with salt and refrigerate until set, about 3 hours. 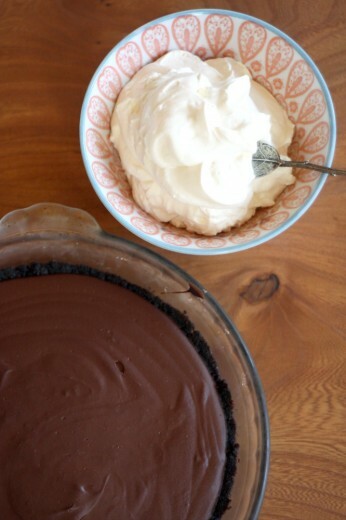 In a medium glass bowl, combine the chocolate with the heavy cream and microwave at high power in 20-second intervals until the chocolate is melted and the cream is hot. Stir the chocolate topping until blended and then cool to barely warm, stirring occasionally. Spread the chocolate topping over the peanut butter filling and refrigerate until just firm, 15 minutes. Sprinkle with the remaining ¼ cup of chopped peanuts around the edge of the pie. 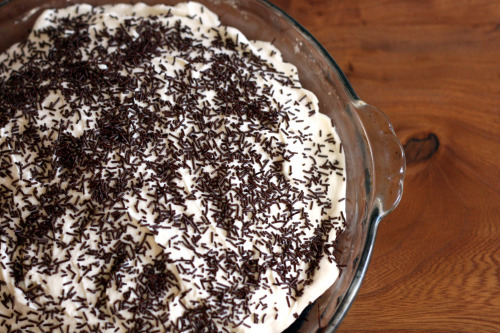 Carefully run a thin knife around the edge of the pie, then remove the springform ring. 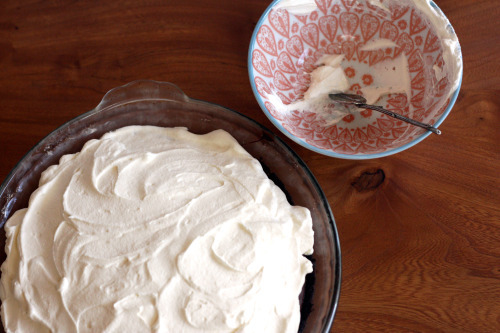 Using a sharp knife, cut the pie into wedges. Run the knife under hot water and dry between each cut. The pie can be covered and refrigerated overnight. Garnish with chopped peanuts right before serving. 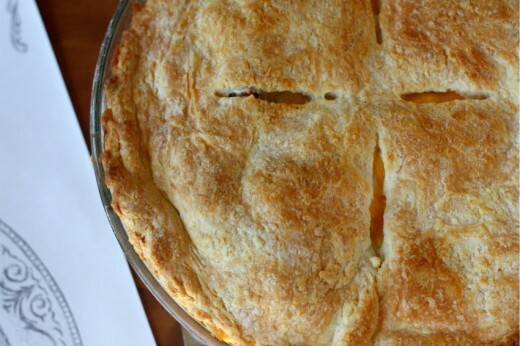 Serve the pie chilled or slightly cooler than room temperature. Last weekend was the end of our CSA. We joined in June and have gotten lovely produce almost every week since. I chose this one because it went all the way through the fall and into winter. Fall produce is my favorite (at least in terms of vegetables), so I didn’t want one that ended in September. Now that it is over, I wonder if I will join again next year. Or if I will choose another farm. 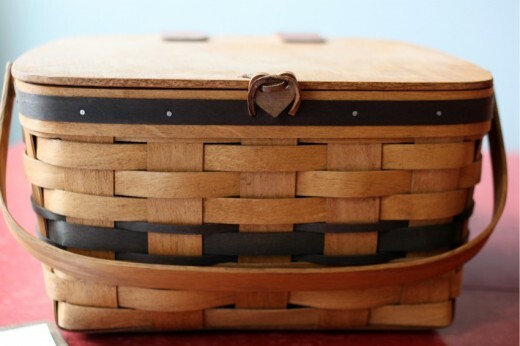 Or if I will just shop the farmer’s market, selecting what I want rather than resigning myself to what they give me. I loved the quality – vegetables so fresh! – and the challenge of using what was completely seasonal. I didn’t love week after week (after week) of carrots and greens. So I don’t know. Something to ponder in the dark days ahead before the days of kale end and the days of asparagus begin. I do love that of the many vegetables in this pot pie, half were from my CSA. The parsnips, carrots, brussels sprouts, and beets were all in that last box. If you take a look at the side bar to your right, you will notice a new category. My friend Kelly suggested I create one for “quick and easy” recipes. I went back through my archives and tagged the ones I would describe that way. Everyone has a different idea of what is quick and easy so you may not always agree with me. For instance, something that bakes in the oven for a while but only took you a few minutes of hands-on time would count in my book. Or something that simmers on the stove with just a stir from you every ten minutes or so. I know that getting dinner on the table can sometimes be a Herculean effort, so I hope you find this category helpful. 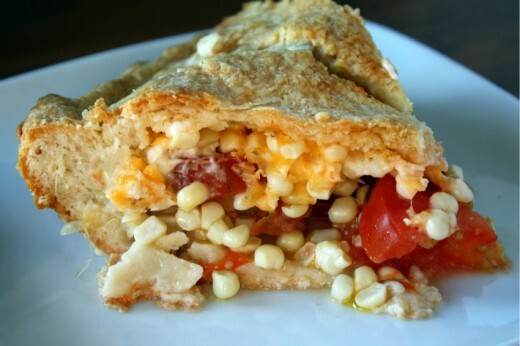 I would not qualify this pot pie as quick – easy yes, but not quick. Look at this as a chance to practice your knife skills. You will be richly rewarded by something extremely tasty and hearty without being heavy. Feel free to play around with the vegetables and their amounts. Everything gets roasted for the same amount of time with the exception of the zucchini, so if you have two beets and one parsnip – go for it. Or if the idea of using half a butternut squash seems fussy to you, use the whole one and don’t use the beets. You can see where I am going with this. My final note is to not pile up the biscuit dough as high as I did because they didn’t cook all the way through by the time they were starting to brown. Next time, I will dollop more delicately. 1. Preheat the oven to 425°F. Place squash, celeriac, carrots, cauliflower, brussels sprouts, beet and parsnips in a roasting pan. Toss with 2 tablespoons olive oil; season with salt and pepper. Roast for 35 to 40 minutes, stirring twice during the cooking. Remove; reduce oven to 375°F. 2. Heat a medium skillet over medium heat. Add just enough olive oil to coat the bottom, then add the garlic and shallots; cook until soft, about 5 minutes. Raise the heat to high, and add the wine. Let the wine reduce by half, about 2 minutes. Add the vegetable stock and simmer over medium-high heat for 5 minutes. Set aside. 3. Combine 1 cup flour, the baking powder, 2 tsp. tarragon, and a sprinkling of salt in the bowl of a food processor. Pulse in the butter until mixture resembles coarse meal. Add the milk and Parmesan, process until combined, and set aside. 4. Transfer vegetables to a large bowl. Add zucchini and the remaining two tablespoons flour and two tablespoons tarragon; toss to combine. Stir in the stock mixture; season with salt and pepper. Transfer to a shallow ovenproof glass pie dish; bake for 15 minutes. Remove from the oven and drop heaping tablespoons of the biscuit dough over the vegetables, leaving some of the vegetables exposed. Place the pie dish in the oven and bake until the biscuits are golden, about 25 minutes. Serve hot.